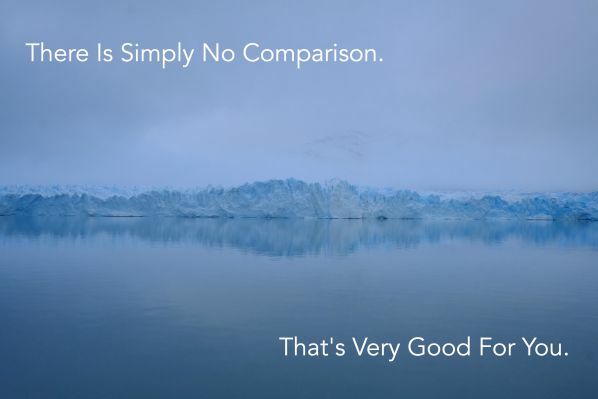 There Is Simply No Comparison. That’s Very Good For You. Keeping an eye on whether lawns were trimmed. Kids were polished. Who served the best martini or chicken broccoli casserole. Now we have the giant reflective mirror of Facebook and other social media which displays the backyards of others as they want us to see it. Most will show it all spiffed up. Some will do the opposite. They show messy houses. Grimy kids. Trying in some ways to balance out the seeming perfection of the view from our screens. I like seeing pictures of everybody’s kids and grandkids. Smiling couples celebrating anniversaries. Folks going on exotic trips, with views of mountain ranges or hot air balloon rides. I often hear, “I can’t look at Facebook anymore.” The comparison between what is going on in someone’s life and what they perceive is happening in others is so vastly different, it is too painful. Even though they can reason that it’s a perception. Probably not reality. Simply by turning on social media, feelings of inadequacy bubble up. Take over. Nagging. Yammering about who you aren’t. What you don’t have. Or do. Or plan to do. I say “they.” I would be lying if I didn’t admit to some of this myself. 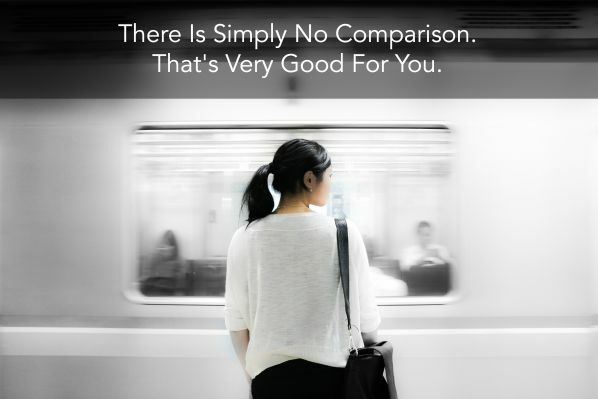 Since beginning blogging, and spending 500% more time on social media than ever before, it’s difficult to occasionally not fall into the pit of comparison. If my mind goes there, it absolutely ruins the whole thing. Takes the pleasure out of writing. So I do my best to make it stop. 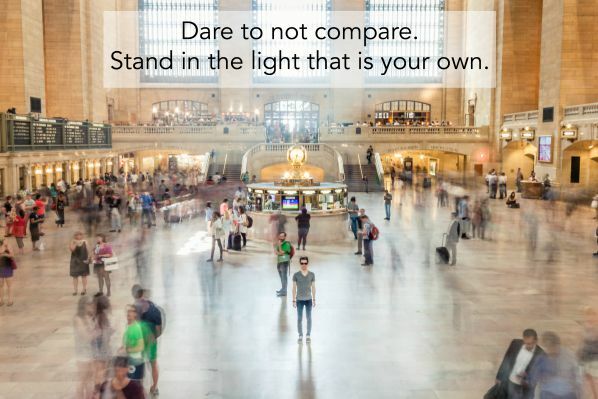 As a friend of mine said the other day, “Comparison is the thief of joy.” Quoting Teddy Roosevelt himself. We all stand within many spectrums. Like circles round us. And we have our place in each one of them. There will be someone in front of you on that spectrum. Who possesses something you admire and wish for. And there will be someone behind you. You may at times wish you had the ability to laugh something off like your co-worker does. But your neighbor wishes she had your talent for gardening. You may wish you were taller. But your buddy wishes he had your ability to see through a problem quickly. Concisely. Our culture loves contests. We watch, “Dancing With The Stars” or, “American Ninja Warrior.” Football. Baseball. Soccer. People who compete. And win. We throw confetti. Pay them more money. Give them a better job in the company. That’s open competition. It’s a game or a known goal. The players have chosen to compete. It’s like being in a game that never ends. There are no quarters or halftimes. No final bells or whistles. It takes practice. You have to catch yourself when your mind is going there. Literally jerk your mind back to the present moment. And focus on you. On what you have control of. Of what you can do. Today. To make this day meaningful or productive for you. That was a power point slide for a presentation I gave at two different blogging conferences last year. On coping with anxiety as a blogger. In the first, I had a nice little audience. 20… 25. The second? I watched as 7, maybe 8 (counting me…) trickled in. I have had two of those bloggers contact me since then. Both went into therapy after listening to my presentation. Realizing they were all balled up with anxiety. One has gone on to write the book that she has always wanted to write. It is being published. Someone may be looking at you right now. As you live your day today. See you as someone they would like to emulate. Admire others. Have mentors. People who inspire you. I agree with Teddy. You will lose more than that battle. You will lose your joy in living. I am conducting a vital survey on women and how they view depression and treatment. Please if you are female, take five minutes of your time to take this anonymous survey! Just click here! Thanks for reading and sharing. SUBSCRIBE and you will receive a weekly newsletter with my most recent post(s), as well as a free eBook, “Seven Commandments of Good Therapy”, a guide on choosing a new therapist or evaluating your current therapy.